The Seattle City Council’s vote Tuesday paves the way for Seattle’s next high-rise neighborhood. The City Council on Tuesday unanimously approved an upzone that will pave the way for the University District to become Seattle’s next high-rise neighborhood. In the works for years, the legislation raises maximum heights, allowing buildings to climb to 320 feet on some blocks near a light-rail station opening in 2021. Mayor Ed Murray and the council are seeking upzones for many Seattle neighborhoods, in an attempt to make developers help create more affordable housing. 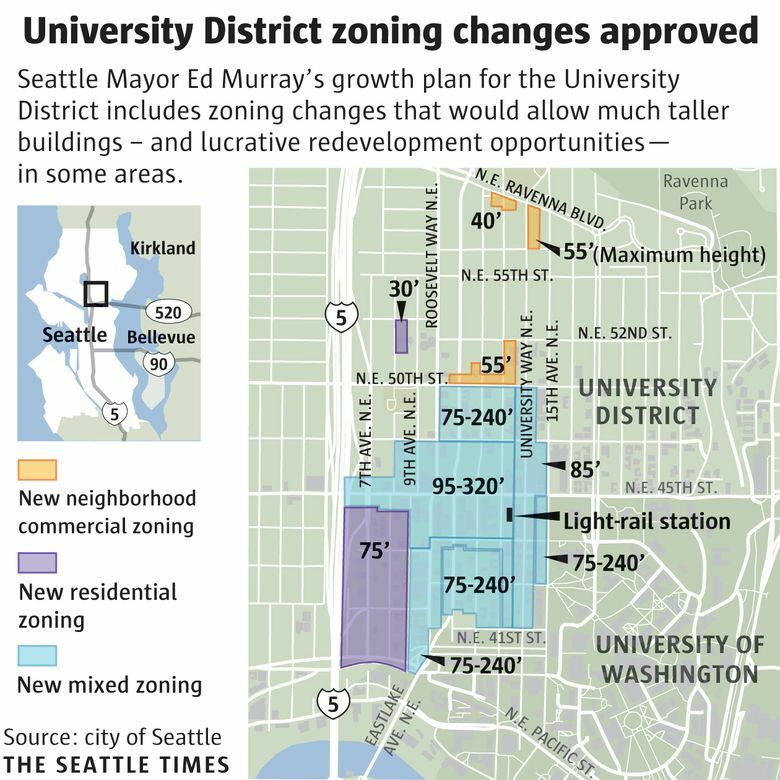 The U District upzone was contemplated longer and is more dramatic than those in other areas. It is the first upzone to trigger a new requirement that developers include affordable apartments in their projects or pay to help the city build them elsewhere. In the months leading up to Tuesday’s vote, critics raised concerns about the upzone’s turning the U District into an upscale neighborhood and pushing out poor renters. Proponents said the upzone would help the U District absorb more residents and jobs, sensibly concentrating growth near the University of Washington and light rail. They urged the council to forge ahead with changes to accommodate Seattle’s population and job boom. John Scrofano, CEO of an online marketplace for fashion boutiques based in the neighborhood, told the council Tuesday that his employees need more places to live. “Please give us housing units,” Scrofano said. Murray says the upzone will help the neighborhood add as many as 5,000 market-rate housing units and create 600 to 900 affordable-housing units. The affordable units built with fees from U District developers rather than as part of market-rate projects may or may not be sited in the same neighborhood. Earlier this month, the council’s land-use committee voted to postpone changes on University Way Northeast, known as The Ave. The amendment came after some small-business owners demanded more time to study how the upzone would affect them. Shilo Murphy, director of the People’s Harm Reduction Alliance, which runs a needle exchange just off The Ave, was among those pushing for the delay. The council voted down a proposal to increase the affordable-housing requirement on the U District blocks slated to be upzoned the most dramatically. The amendment would have required developers on those blocks to make 10 percent of their apartments affordable or pay an equivalent fee, rather than 9 percent. Council members Mike O’Brien, Lisa Herbold and Kshama Sawant voted for the losing proposal. The same three members were also defeated when they sought to remove from the upzone a section of existing homes and apartment buildings between Northeast 50th and Northeast 52nd streets. They cited concerns about redevelopment leading to displacement but didn’t persuade their colleagues. The upzone likely will spur the redevelopment of several U District parking lots, many owned by University District Parking Associates, a company established in 1944 by neighborhood business owners. 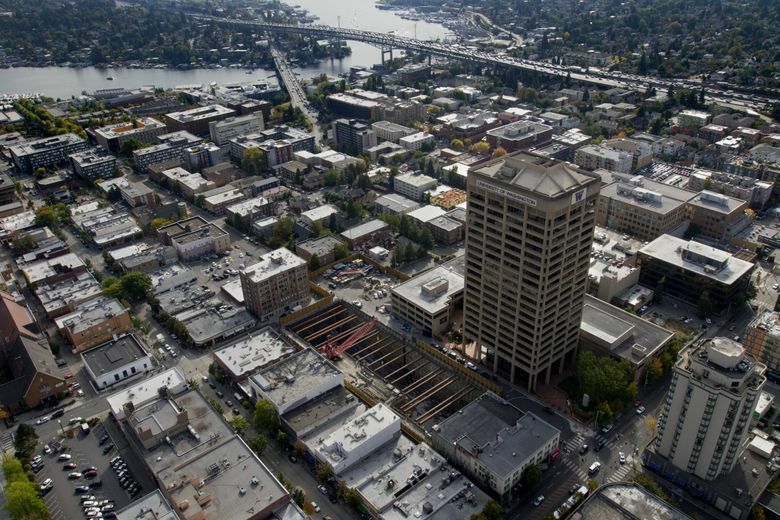 The UW plans to build an office tower atop the light-rail station.